The Safer Future Youth Development Project (SFYDP) has an own Water and Sanitation Department with motivated staff, who are very skilful in community training. 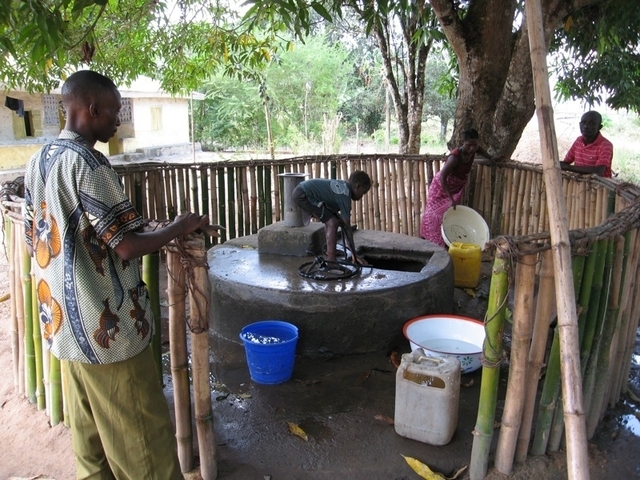 The organisation has gained experience with underground Rainwater Harvesting Tanks (RHT), the repairing and maintenance of water-wells and different techniques of water purification like SODIS (Solar Water Disinfection). In 2004 two staff members of the SFYDP were trained in the method of constructing and maintaining RHT at the Barefoot College in India. So far the SFYDP has built eight RHT and is presently finishing the constructing of some other tanks in cooperation with Blue Planet Run, Peer Water Exchange. In 2005 Lifewater International trained three of our staff-members in well repairs and maintenance and about hygiene and sanitation principles. In 2008 two staff-members were also trained about Community Lead Total Sanitation (CLTS) by UNICEF. Our main focus is always on the cooperation with the affected community. Community members are involved in the construction and totally responsible for the maintenance after completion. Therefore they are trained in the correct utilisation of the water source, informed about hygienic standards as well as water chlorination. Through workshops the awareness of the entire community is guaranteed. To exchange these techniques with other African Countries the Project Manager visited Timbuktu, Mali, in October 2007 to share his knowledge. The SFYDP as a member of the Peer Water Exchange program already cooperated several times with the Blue Planet Run Foundation in constructing tanks for schools. Another strength of the Water and Sanitation Department is to repair water-wells that are broken down due to poor maintenance. 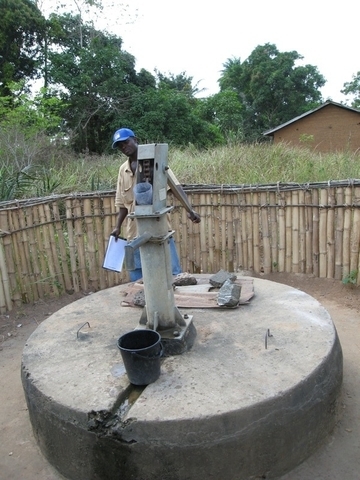 Since 2005 the SYFDP repaired over twenty water wells in remote areas. New hand pumps have been installed and through a workshop the entire community was introduced to the correct maintenance of water-wells. This helps to prevent further damages and guarantees the right utilisation, as water-wells are one of the most common water sources in Sierra Leone. One Repairs kit for the Chiefdom, maintenance kits for thirty villages and India Mark II pumps. The only physical things handed over to the beneficiaries in this project are the repairs kit for the chiefdom, the maintenance kits for the villages and the Indian Mark II pumps. As inhabitants demand that the Paramount Chiefs take their responsibility serious, he will be willing to store the kit and the spare parts and organize its proper utilisation. After the technicians have been trained they will select two people per village, who will be trained as pump-caretakers. The pump-caretakers take responsibility to follow some hygiene-principles like the clearing of the area around the well, the prohibition of doing laundry, defecation etc. 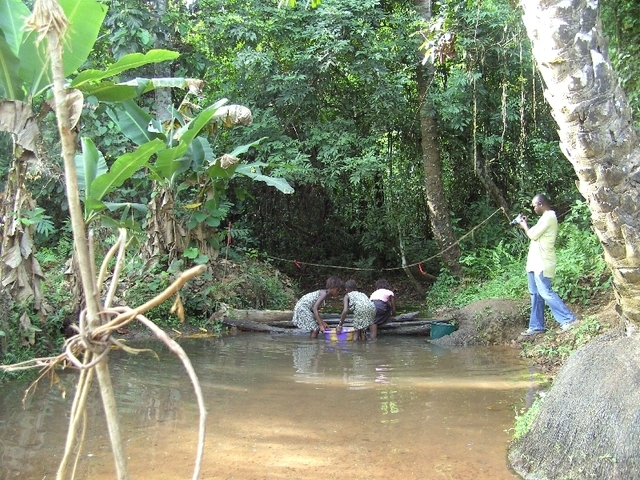 in the wells surrounding. During the workshops for the Technicians and the well-caretakers hygiene and sanitation principles will also be taught. At the same time we will train the participants in different household water-treatment methods. One technician of the SFYDP will get in contact with the Paramount Chief and other Chiefdom officials to discuss the water-well situation in the Chiefdom. After that he will move to the locations to check the actual status and select the thirty most affected communities. We will use Survey-forms to make the selection as objective as possible. The Paramount Chief will then select four reliable people of the Chiefdom, who will later be trained as technicians. There will be a one-week workshop in Masheka, the Chiefdom Headquarter. The Paramount Chief will select four reliable people, who will be trained as well-technicians. In this workshop we will include both theoretical and practical training in the field. After the participants succeeded in completing the workshop, a full repairing and maintenance kit will be handed over to the well-maintenance-team, which will be supervised by the Paramount Chief, allowing them to be able to take care of their wells. In case of serious problems they will be able to consult the SFYDP, if the technicians are not able to fix the well. The technicians will select two people of each participating community, who will be trained in proper maintenance and caretaking of the wells by the SFYDP. The pump-caretakers will be trained how to handle the well to avoid any problems. This includes clearing of the surrounding area, tightening screws, chlorinating the water-well and advising the villagers about the proper usage. They will also be trained to notice upcoming problems at an early stage, after which they should inform the well-technicians. To ensure that the villages will be able to pay for spare-parts in the future, we’ll advise them to start a fee-system, where each household has to pay a certain amount each month to the hygiene and sanitation committee. This money should be there for any arising repairs-cost. The pump-caretakers are the two permanent members of this hygiene and sanitation committee. In addition to that we will suggest letting other people join this committee. To make it as representative as possible, they should include elders and youths as well as male and female participants. The well-maintenance-team will receive a full repairs kit and spare parts for the Chiefdom. This kit contains all tools, necessary to fix the most common problems of a well. Please find the detailed items in the attached budget. In case of any well-problems the kit can be used by the technicians under the supervision of the Paramount Chief. The reason for problems lies often in bad maintenance and water-wells could be fixed easily if the tools were there. For this reason a small maintenance-kit will be given to each community. This kit consists of needed tools to do periodic tasks. Please find the detailed items in the attached budget. Three months after the workshop the Technicians will again meet in the Chiefdom Headquarter together with the trainers from the SFYDP. There they should report about their activities, experiences and problems. If they had wells, which they were not able to repair due to lack of materials, we will analyze the case together. In addition to that all the things learned will be reviewed together to deepen the knowledge. As the whole focus of the project is on maintenance there is no extra activity in this section. The communities will contribute local materials like sand and unskilled labour in case their well needs to be repaired. In addition to that the Chiefdom will have to provide the training hall for free. It is good that SFYDP after 3 months you will have a refresher training for the technicians, is the time where they will manage to exchange their experiences and problems solving. Also the project is going to provide Repair- kits and maintenance- kits to Koya Chiefdom and to 30 villages respectively. Can you give explanation on how are you going to sustain the program when some of the tools or materials from the kits are no longer in use because of wear and tear and some time because they are only used once and when the problem happens they need other material like cement, at the same times in your proposal you say in a Maintenance Model “ No extra activity in this section”. Your project is going to last for only four months, six months on wards some material may be needed at the same times no fund has been set aside the purpose. Don’t you see that after a certain years you will be required to provide similar support to the same area?. There is a monitoring and evaluating team setup which will be used to monitor all components of the project. It will be in direct contact with the authorities in each community, the trained responsible team(i.e the technicians and pump caretakers).Quite apart from that, the monitoring team will take periodic on the spot visit to each of the communities without notice. Could you provide us more details on how the previous project of the same type worked out? Your report at http://www.peerwater.org/projects/1 is rather brief. If you have more information or have conducted a followup visit, please add it to that report and let us know. Any info from earlier 'pilot' projects is very valuable in assessing new ones. 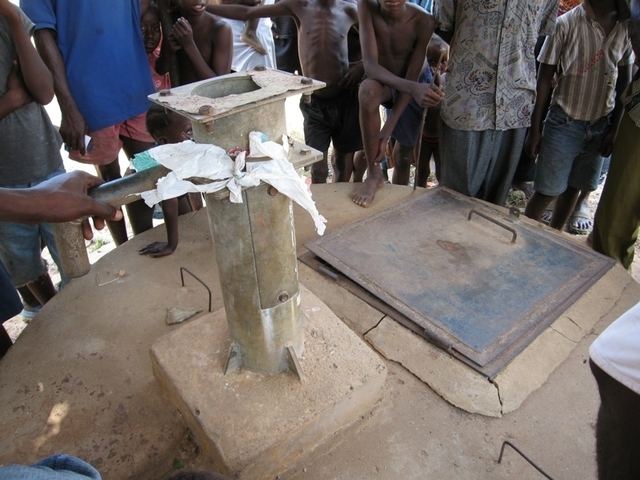 We have uploaded an additional picture showing a boy using the repaired well. On this picture you can also see how we advise the communities to protect the well, by building a fence with local materials and by keeping the area clean. We will gather the data from the follow-up visit and submit a final report. Thank you! We have uploaded an additional picture showing a boy using the repaired well. On this picture you can also see how we advise the communities to protect the well, by building a fence with local materials and by keeping the area clean. We will gather the data from the follow-up visit and submit a final report. I like the idea of helping communities learn how to fix their own pumps. But I wonder if part of this project is to determine why the pumps went unrepaired in the first place. Was it because there weren't trained pump maintenance committees? Were communities not paying funds for water use? Can this program help communities learn about these underlying causes and remediate those while fixing the pumps? in the past we did a lot of projects together with various communities. While implementing we always try to sit down with community members, especially the Chiefs and the Headmen. From there we try to find out about existing problems and also about their cause. The experience we have learned so far has shown, that most of times the wells are not repaired anymore because, no one among them has the necessary knowledge to do it. Another problem is that in many cases no fees are collected from the users. In the training activities of this project, we want to adress this issues and point out the importance of collecting fees. Furthermore we are trying to pass on the necessary knowledge to repair and maintain water-wells. 1. In appl 7 of 2006 there was a question on the cost of mark II pump in India that was not addressed then. As you say now all the parts are readily available, where? From how far do they need to get the parts? On earth google Port Loko looks like a sprawled village. (a picture with location of Port Loka http://www.panoramio.com/photo/1056114). 2. Very nice detailed budget, impressive. Thanks for the layout. In the admin section the salary is for 2 months where as the chlorine is for 30 units. Can you specify for how many wells and for how many months? 3. Disinfectant: what product is used and how often is it applied? It appears to be expensive depends what is included in the cost. Is cost of transporting the product also added? 4. Was the water tested for other possible contaminants? If so, a report of the chemical analysis would strengthen the quality of this proposal. 5. Reports of some past projects with numbers and pictures of the people using the water that also shows monitoring, which is one of the components to acheive sustainability would be appreciated. All the parts needed for construction, repairs and maintenance are available in all thirteen district headquarters. So if any materials are needed people can buy the parts in these shops. The picture from Port Loko you have linked is out of town at a waterside. 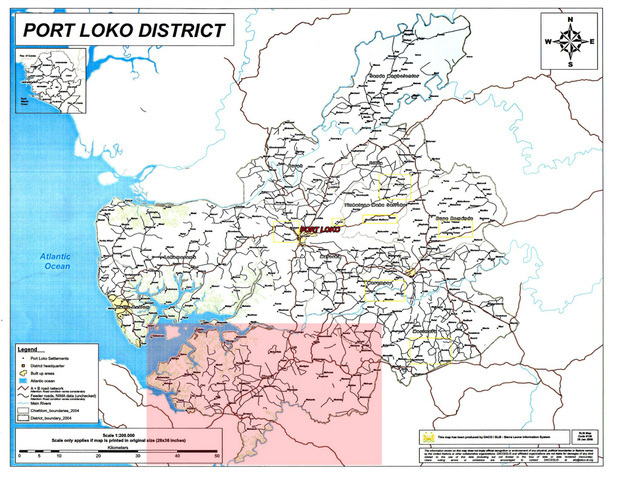 Port Loko itself has over 30,000 inhabitants. Our activities are anyway focused on rural communities inside the Port Loko District, not inside the city. The chlorine we budgeted is not connected to time. We will provide a maintenance kit for every community. Inside that kit there is also chlorine included. As we are active in thirty villages, the quantity for this budget item is also thirty. 3. For disinfection we give the communities chlorine. They need to put two table-spoons of it into the water-well every three months. The high price for the chlorine is because the amount we supply them will allow them disinfect the well for up to two years, as the package is of 500mg. 4. The water in the area was not tested so far. During our survey we will try to do a water-test and share the information with you. 5. As also requested by Rajesh, we have uploaded another picture (making a total of six pics). We'll collect the data from the follow-up visit and share them with you in a report. But there are some other projects online, which also include a lot of information and pictures. Thank you very much for the response. The cost of mark II pump in India is USD99 and your cost is USD1020. wow! ten times more. Here is a website and check out the operation with Africa . Regarding application of chlorine, I am not an expert, please make sure to do water analysis of the relavant contaminants to avoid any adverse health effects in future. Good Luck. Hi, It seems the website link did not show. Trying it again, if fails you man type on google search: mark II pump, india africa, tradeindia.com. I have a similar question about the sustainability of this intervention. However, since I know nothing about Mark II pumps or Sierra Leone, I have to ask. For example, here in Nicaragua, the most common pump and almost the only one seen these days is the rope pump (www.ropepump.com), and because it is so common, replacement parts like pistons and rope are available in almost any hardware store in nearby towns. Is that the case for these Mark II pumps, are parts readily available at a future date when your group is no longer intervening in these communities (and the supplies run out as Iskaka asks)? Nice detailed budget. That helped to understand more as well. Wow, these Mark II pumps are very expensive. Our rope pumps cost about $180 these days, but perhaps your pump works for depths more than 60m. Really the bulk of your budget are these kits and replacement parts (it seems). Maybe that can be reduced somewhat and look to other ways like community contributions to fund replacement parts? SFYDP does establish formidable committees in each area of operation. These committees which have the total support of the chiefs and elders in each community are charged with the reponsibiliy of maintaining the sustainance of completed projects. Like for this project in question, each member will have to be charged a certain fee for the water usage. The amount will be set by the hygiene and sanitation committee. The fees collected are managed by the formed local commitees in each community under the supervision of the SFYDP. The income from these fees should ensure sustainability by covering maintenance cost. With regards of the Indian Mark11 pump's cost and spare parts, It is among the others in Sierra Leone that is very common and its cost is more reasonable than all other pumps in the country. At present you can easily find most of its spare parts nearly in all regional and district headquarters. It is very suitable for lifting water from depths up to 90 metres. It has a heavier handle with a T-bar and additional weigth that ensures reduced pumping effort. Even a teenage child or a woman can easily operate the pump. We will however try to contact you in the future to see how we can intoduce such pumps here and see the possibility of making them and their spare parts available in the country. If you are interested we can send you a picture by picture assembly of the rope pump using old auto tires, wood, pvc tubing,cement blocks, and 14" cord. These work up to 20 meters in depth. I just met someone from Tamil Nadu India who got a grant from a Dutch foundation to do several rope pump projects. They found a local manufacturer and then adapted it a bit. Now if they were on PWX, it would be easy to give more info! :) But its spreading. Maybe you will have success contacting someone at one of these workshops. Question on sustainability especially when the number of beneficiaries is so high. Maintenance and monitoring program should be added to all the past, present and future projects. Cost of a handheld garmin GPS is USD150-200 and is very useful to track data. The co-ordinates will not only map the location but can be linked to computerized data to Identification numbers of the water sources. All sorts of monitoring data can be linked to these ID numbers that would help to track and establish sustainable communities. There fore I recommend the project to be funded. Developing a long term local support systems for existing water facilities is a much overlooked area. Many donors do not want to fund these projects, but this simply means that donors will have to pay for these complete systems and pumps again in the future. I would encourage these projects in all institutions. I think this is an excellent project. I would give this project much higher support if there was much more data from the earlier well-repairing project. Even a followup visit since it was completed in February 2006 would have provided much more data on the effectiveness of this approach. I trust that all the SFYD projects will be updated on PWX. The concept of creating maintenance teams locally is a good one, however, this proposal does not convince me that this is the best way forward, and the most sustainable. I worry that these teams will run out of maintenance supplies (pump parts) and return to the same problems of being unable to afford to purchase replacement parts and coming back to SFYDP for help.